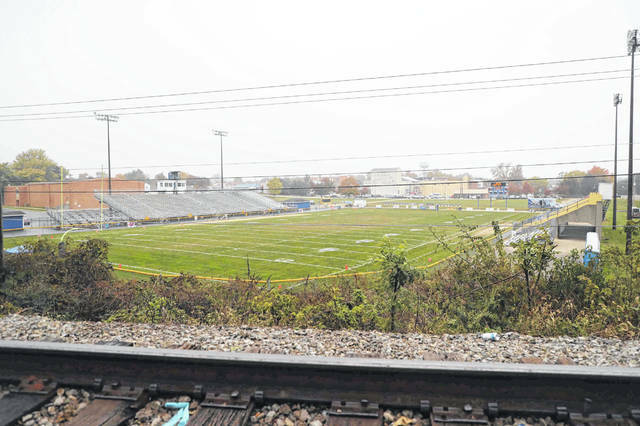 St. Marys’ Skip Baughman Stadium is seen from the perspective of those who watch games from nearby railroad tracks. 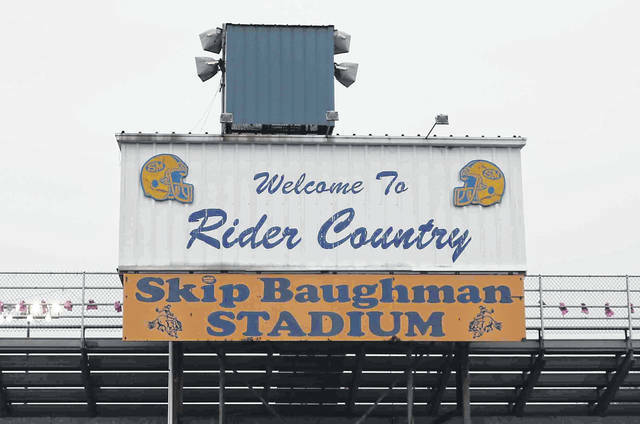 The home of the Roughriders has been named for former coach Skip Baughman since 1994. There is something about a demise, whether it be a person or place, that demands some sort of acknowledgment. For people, it generally comes in the form of an obituary, but what should be done when a football stadium passes away after 81 years of gridiron history? That’s the question on the minds of many when it comes to the St. Marys High School’s football stadium, since 1994, Skip Baughman Stadium, named for the school’s most legendary coach, with an apologetic posthumous nod to Galen Cisco’s football coach of the early 1950s, Jack Bickel, and to current head coach Doug Frye, who certainly knows a thing or two about coaching football. Sure, Alumni Field, the new home for Roughrider football will open in 2019 and, at a capacity of 4,500, will be bigger and located as part of the new high school’s grounds just north of the overpass leading into town. The concrete will be freshly poured and cured with none of the degradation that occurs over time, and the new place will lack for little, save one ingredient that the old pace has in abundance, history. The stadium was originally constructed during The Great Depression and opened in 1937, the product of a Works Progress Administration work crew. While the original high school, which opened in the fall of 1924 for its first school year did have football behind the school that fronted West South Street, it was a humble patch of turf that ran east to west with wooden bleachers. When several athletic-facility projects were commissioned, including stadiums in Celina and Van Wert, St. Marys would get its stadium, albeit a smaller one than neighboring schools, and, of course, there’s a story behind that. Many of the older Roughrider supporters, such as 1951 graduate Jack Lawler, know the story. Nonetheless, the new field was laid out as almost all fields are now, that is, north to south and thus began the history. For more than a half century, the stadium really lacked any official name. With his retirement from coaching in 1994, it became, to honor him, his 273 wins, 15 Western Buckeye League crowns and four state championships, Skip Baughman Stadium. There would be the peaks and valleys that most school sports programs see. Certainly a peak that preceded Baughman’s first season in St. Marys in 1958 were the teams coached by Jack Bickel, who relied heavily on a pair of fine running backs. Such games tend to stick in the craw of the truly loyal fan even some 65 years after a clock went to all zeroes. For those two backs, both would have their successes, with Cisco’s more well know as a running mate of Heisman halfback Howard “Hopalong” Cassady at Ohio State under Woody Hayes and then for years as a major league pitcher and then respected two-time World Series-winning pitching coach. Davis, on the other hand, had his own version of success, returning to his high school alma mater after college to teach industrial arts. When long-time Baughman assistant Denny Long joined the faculty in 1962, he remembers then Superintendent H.H. Cook almost apologizing for the stadium’s shortcomings while showing him around prior to his first season coaching under Baughman. However, the purchase couldn’t be worked out, and within two years a bowling alley sprang up on the land where Cook envisioned a new stadium. And, so those cooler-carrying, non-paying Roughrider fans who have their own collective lengthy history of standing up by the tracks watching the action on Friday nights from above the south end zone didn’t have to move to the other side of the tracks. As far as the stadium’s shortcomings, in addition to its smaller size and less-than-ideal parking and now-crumbling concrete, perhaps no shortcoming was shorter than the north end zone that ran almost right up to the back wall of the school. Kay Albert, who arrived on the school staff in 1961 as a teacher and coach and eventual athletic director, contests Long’s 9-yard recollection. Another shortcoming of the site actually impacted the Roughrider baseball program each spring. During the 1970s, when Baughman was entering a period of great success, eventually winning seven league crowns in the decade, school officials decided that the time was right to ask for community help in funding a stadium renovation, relying on a financial commitment and volunteer labor as well. The program was called Project 60. St. Marys supporters were asked to pay $60 for what then Athletic Director Kay Albert called a franchise fee. The idea was, in similar fashion to what professional teams have done with seat licenses, all those wishing to guarantee the right to buy a reserve seat for home games paid $60 per seat in the permanent home stands. In addition to the field being redone and moved further away from the back wall of the school, there were new steel bleachers and a new press box, the latter largely from the efforts of former Roughrider player, shop teacher and Baughman assistant coach Greg Freewalt. The scoreboard was also relocated from the back wall of the school to behind the south end zone. Eventually, the new Alumni Field will begin to add the only ingredients any new facility lacks, history and tradition, but the one tradition that can’t be reenacted is the Tracker Backers, those nonpaying Roughrider supporters who, if the local stories are accurate, first began gathering up on the those tracks in the 1920s when the football field ran east and west. While the track is less used now and it’s been quite some time since a train actually came by on game nights, older St. Marys players like Larkin can remember signals being interrupted by a train whistle and even a train from time to time that would come to a halt to watch 15 minutes or so of the action on a crisp, cool Friday evening. As far as the memorable games and players, well, each has his or her own. Another long-time Baughman assistant, Roger Duncan, who arrived in 1967, remembers the field from the perspective of an opposing player when he was a Van Wert Cougar losing to a Baughman-coached team in the late 1950s, but he also could still see through coach’s eyes Sidney’s powerful teams of the late 1960s and future Joe Montana favorite target at Notre Dame and NFL wide receiver Kris Haines, coach Dave Haines’ son on that field. However, that didn’t stop the Roughriders from ending a Yellow Jacket 30-game winning streak to the delight of the St. Marys’ faithful in the stadium and on the tracks that night. One game that stands out in Jack Lawler’s mind is an early 1980s contest against a very good Elida team. Later than evening, it was Rusty Krugh, Galen Cisco’s nephew, that punched the winning field goal through the uprights for a Roughrider 10-7 win, sending a lot of spectators clad in orange and black home unhappy. From Galen Cisco to his son Jeff, whose 35 touchdowns in 1979 despite rarely playing in the fourth quarter on a dominant undefeated and never challenged ‘Rider edition and on to Ronnie Keith and Jimmy Koch and Mike Elston, many will remember the stadium’s canvas upon which they painted their Friday night masterpieces. Other Roughrider fans will begrudgingly give a nod of respect to the memorable opponents through the years who went on to play so well in college and even the in the NFL, who once competed on that turf, such as Celina’s Jim Otis, Ottawa Glandorf’s B.J. Dickey and Wapakoneta’s Mike and Mark Hammerstein. As for second acts, there will be one for much of the facility. While there will be some alterations, the field itself will be preserved and serve as the focal point for a youth-football complex for practices and games. 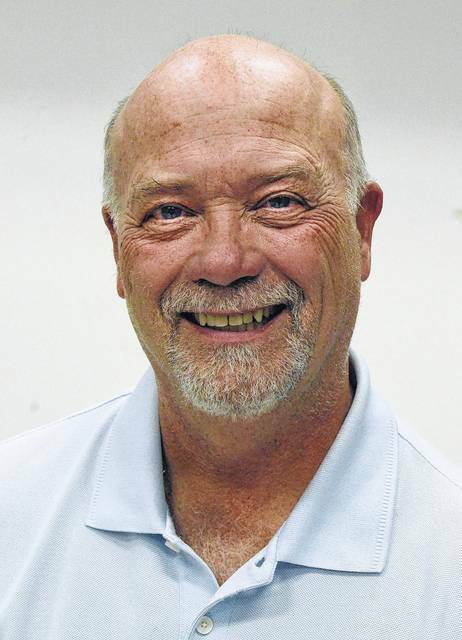 Current St. Marys superintendent Bill Ruane likes the sound of that. Yes, Alumni Field will be opening soon, with all its glitz and glamour and, more importantly, the convenience that comes when a school’s athletic facility being at the school rather than several blocks away, and there will certainly be excitement, especially on opening night for Doug Frye’s Roughriders. But, at the Rustic Haven, where Lollie waits with coffee pot in hand for that certain table full of early Saturday morning breakfast boys who come each week to dissect the previous evening’s games and also to remember the past, there will still be talk about a certain football stadium with that short north end zone and those significant drainage issues and her other warts, a place not unlike an old friend, that you loved despite the foibles. John Grindrod was an English instructor at St. Marys Memorial High School from 1978 through 2005. He is currently a freelance writer, editor and author of two books as well as a regular columnist for The Lima News. Permission has been granted from this publication for the release of this story. John can be reached at grinder@wcoil.com. This entry was tagged stmarys. Bookmark the permalink.